For decades the magic line of legendary illustrator Al Hirschfeld captured and saluted entertainment legends while delighting millions of fans. His illustrations richly document the history of entertainment in the twentieth century. For this special exhibit, the Paley Center delves into its permanent collection of Hirschfeld’s work to present drawings that capture the artistry of dynamic performers including Judy Garland, Bruce Springsteen and Diana Ross, comedy greats such as Bob Hope and Groucho Marx, cherished television favorites including I Love Lucy, The Golden Girls and multiple incarnations of the Star Trek Universe and many more. Though most famous for his black and white drawings, the exhibit presents an opportunity to view multiple examples of his work in color including inspired takes on Jackie Gleason, Perry Como and more. In a way, his work provides a visual metaphor for the mission of the Paley Center, as he too preserved the work of the many personalities and characters of television and radio. 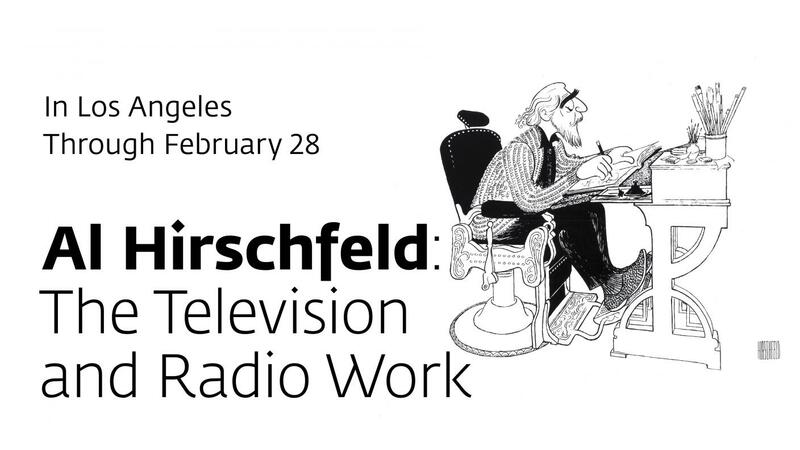 The exhibit also highlights the work of performers captured in Hirschfeld’s illustrations with in select video clips from the Paley Archive.